Fun? It comes firstRyze have developed and built the Tello drone to focus on fun first. With this nifty little gadget, you can learn to fly drones for the first time and begin to understand drones even further with the ability to code. Industry Leading Tech Tello is incredibly easy to fly, with everything housed in a special app designed specifically to be pick up and play, with a friendly user interface that even kids can get behind. It's also controller compatible, so you can get even more precise movements. Flights are controlled with DJI's Flight Tech, giving you industry leading and stable flights that can all be viewed through a VR Headset. Fun Flights! Tello is all about fun, so let's talk about what you can do! 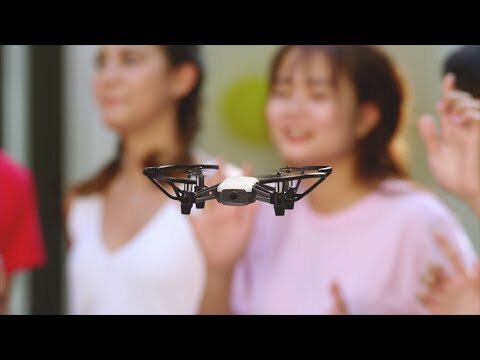 With all the technology that Ryze have put inside Tello, you can literally throw it from your hand (while it's on) and watch it take to the skies! Show off to your friends with radical 8D Flips that you can do from a single swipe and Tello will fly up and down in your hand automatically with Bounce Mode. Different Selfies! Into taking photos? Tello has a 5MP camera, that's perfect for taking quick photos that will make your Instagram sing with glee or get into Tello's EZ Shots, which record short, videos in different pre-programmed modes: Circle, 360 and Up & Away. Easy to Learn, Easy to MasterFirst time in the air? Don't worry, Tello's super safe. The drone comes with low battery protection, a failsafe protection that will ensure you land safely in the event you lose connection and a smart tech that allows for precise hovering with Vision Positioning. Understand your DroneTello's all about learning through fun. Whether you're just grasping how to fly or wanting to dive deeper into the drone's functionality, it's all there. With the Source Development Kit (SDK), you can create new possibilities for Tello to take on. The SDK is built upon Scratch, a block-based visual programming software, allowing for kids and teens who have an interest in coding and goes even further for those a little more advanced.